Prior to 1996, discussions of endangered mammals rarely mentioned the Philippines. The Red Data Book, the official listing of endangered species by the IUCN (International Union for the Conservation of Nature), was intended to be based on purely objective criteria, but since large mammals are known much better than small mammals, large species were most likely to be listed. For a country like the Philippines, with a generally poorly known fauna of mostly small mammals, it is not surprising that few species were listed aside from the tamaraw and a few other conspicuous species. However, in 1996 a new edition of the Red Data Book was published that was based on a new effort to closely examine all species equally, and to bring into the effort all of the new information gathered in the past decade of intensive research in many tropical countries, including the Philippines. The result was staggering: A full quarter of all known species of mammals—1,100 out of the world total of 4,500—are now listed as threatened to some significant degree. From the Philippines, 49 species were included, enough to place the Philippines seventh worldwide in the number of threatened mammals. But the greater shock came when the sizes of the countries was factored in. First on the list were giant nations—Brazil, Australia, China, the United States—but when corrected for size (that is, when the countries were compared on an acre-for-acre basis), the Philippines vaulted to the top of the list. When size of the countries is considered, there are more endangered species of mammals in the Philippines than any other place in the world. When we plot information about these endangered species onto a map of the Philippines, it quickly becomes apparent that there is a pattern to the distribution of the endangered species. Each of the faunal regions, which are defined by the Ice Age islands and land-bridges within the Philippines, has a substantial portion of its fauna of unique species that is endangered; there is no place in the Philippines that has been exempt from the forces of destruction. Little Sibuyan Island, on which we found five new species of mammals, has three endangered species— two of which are among the new species we discovered; on tiny Camiguin, where we found two new species, one of which was already endangered at the time we found it. Greater Luzon and Greater Mindanao each have about 24 percent of their unique species endangered, and on Mindoro and Greater Negros-Panay, 63 percent and 80 percent, respectively, of the unique species are endangered. Individually, these figures are among the highest for any faunal regions world-wide. Collectively, they paint an unparalleled picture of approaching extinction. A look at to the map of remaining old-growth rain forest cover in the Philippines provides a likely explanation: The less rain forest that remains in a given region, the greater the proportion of endangered species of mammals. Deforestation has destroyed the habitat of the animals, reducing their populations to ten percent, one percent, or a fraction of a percent of their original sizes. The tiny sizes of the populations is enough reason for concern because of the rising potential for inbreeding problems, but perhaps more importantly, as small populations decline in size they are increasingly vulnerable to complete destruction by periodic storms, droughts, floods, disease, or other factors such as the occasional failure of a fruit crop in a small area of rain forest. They are also much more vulnerable to extinction by hunters, because their numbers are so small and because they cannot effectively hide when their patch of habitat can be crossed by a man with a dog in just a few hours or less. Tiny populations are nearly always teetering on the brink of extinction. From our studies of the distribution patterns of mammals in the Philippines, we know that reduction in the area of habitat nearly always results in the extinction of species. 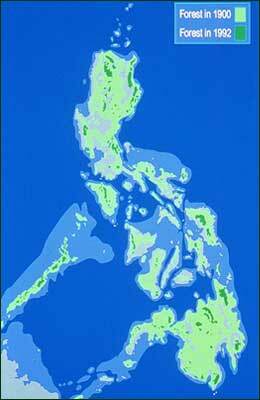 The clearest example comes from our field work on some of the islands that made up Greater Mindanao. Over a ten-year period, our teams inventoried the mammals on Mindanao and a series of four smaller islands: Leyte, Bohol, Biliran, and Maripipi; the smallest of these is only 22 square kilometers. We chose them because all still had fairly extensive tracts of old-growth rain forest from near sea level to the mountaintops when we did our surveys. All of these islands were part of Greater Mindanao until about 10,000 years ago (which is a brief moment in geological terms), and all share a virtually identical mammal fauna—in all respects but one. Mindanao has the largest number of species of native, non-flying mammals, 25. Leyte, which is one-tenth the size of Mindanao, has 15. Biliran, which is about one-tenth the size of Leyte, has 12 species, and Maripipi, about one-tenth the size of Biliran, has 7 (Bohol, with 13 species, was added just for good measure). There are no unique species on any of the smaller islands—they all have a reduced set of the species also found on Mindanao. Old-growth rain forest covered about 70 percent of the Philippines in 1900. By 1992, that had been reduced to only abtou eight percent, in scattered, usually small, fragments. Redrawn from National Mapping and Resource Information Authority, 1988.